The measurement procedures and settings for harmonic/flicker standards testing have been precisely defined. Engineers must also stay current with the specialized knowledge and up-to-date information required to periodically review the contents of the standards and perform the standards conformance tests. The model 761922 Harmonic/Flicker Measurement Software enables engineers without specialized knowledge to perform a range of operations using the WT3000/WT3000E Precision Power Analyzer including judging standards compliance and outputting test reports. Need /G6 option with WT3000/WT3000E for harmonic standard testing. Need /FL option with WT3000/WT3000E for flicker standard testing. Need /FQ and /FL options with WT3000/WT3000E for 3-phase flicker standard testing. WT3000/WT3000E*: IEC61000-4-7 1991(window widths of 16 cycles), IEC61000-4-7 Ed2.0Am1(Harmonic and interharmonic measurement supporting window widths of 50 Hz/60 Hz, 10/12 cycles). 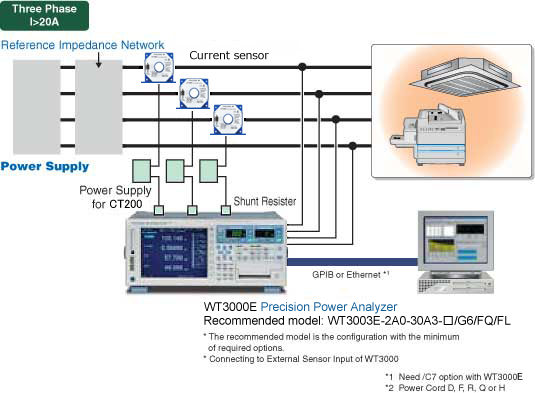 Use of WT3000/WT3000E enables measurements conforming to standard. Saves waveform/harmonic data in CSV format. System Construction for IEC testing. Displays harmonic measurement data as a single list. 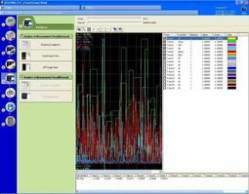 You can capture various types of data measured into your PC at 200ms fixed intervals. Thus, you can view trends graphically. This feature lets you monitor power supply voltage fluctuations, changes in current consumption and other time-based variations. 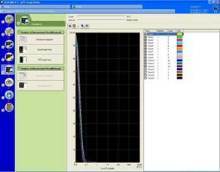 Lets you display voltage or current signal waveforms, and measure frequencies and peak values. Moving the cursor lets you display values for the displayed waveform. You can print harmonic measurement results as value lists and graphs, and save image data. Titles and comments can be entered in reports, letting you enter information such as measurement dates/times, device names or control numbers. You can enter settings on the WT3000/WT3000E from your PC. The wiring method, filters, and scaling settings can be modified. 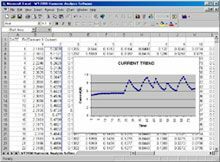 Waveform data and harmonic current values can be saved on the PC. Measured data can be saved to .csv files for easy access by spreadsheet programs such as EXCEL. 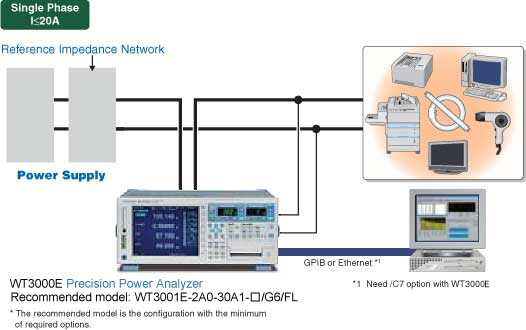 Voltage fluctuation and flicker measurement complying with IEC 61000-3-3 is executed. Calculates all the voltage fluctuation and flicker values of dc, dmax, d(t), Pst, and Plt, compares them to the preset limits, and indicates the total judgment. The final values of dc, dmax, Tmax, and d(t) are compared with the respective limits, and the judgment (pass or fail) is displayed to the right of the final value. If a steady-state condition does not occur during the measurement period, it is considered to be a fluctuating condition. The measurement result of dc is displayed as Undef (undefined), and the judgment of dc is displayed as Error. The short-term flicker value, Pst, is calculated, compared to the limit, and the judgment (pass or fail) is displayed. You can show Trend Graph View. You can select from the following measurement functions. You can select the element and color to be displayed on the CPF graph. Up to four elements can be displayed simultaneously. You can set a separate color for each element. 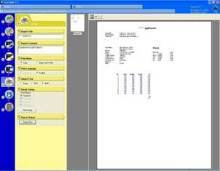 You can create reports using the data measured with the software. 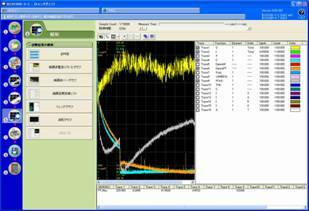 Can evaluate measurement data while harmonics are being measured by a WT3000/WT3000E. 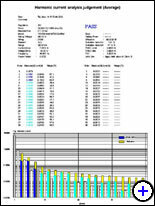 NOTE: Saved measurement data can also be read and displayed during offline operation. Lets you observe harmonic variations as bar graphs or lists of numerical values, while harmonics are being measured by a WT Series digital power meter. Use this mode to observe changes in harmonic data. Waveform Observation Mode Lets you observe measured waveforms. Use this mode to observe waveform states. Can evaluate * data by class (A, B, C or D). Can evaluate whether the current value is within the maximum permitted harmonic current limit value (or within the power ratio limit value). Maximum values and average values in harmonic measurement data can be compared and measurement data differences can be displayed as bar graphs and numerical values for each harmonic order saved. This mode lets you evaluate* whether values are within the 5% range specified by the standard (repeatability). *Evaluations conforming to the IEC61000-3-2 Ed. 4.0 are only supported by WT3000/WT3000E. *3: Many AC Power Sources are available to provide the low-distortion AC Voltage and frequency to power the device under test. In addition, for fullcompliance testing, the power source must be capable of supplying the full 16 A load current specified by the IEC standard. Contact your local Yokogawa representative for recommendations. *4: The model that full supports the standard is the WT3000/WT3000E. 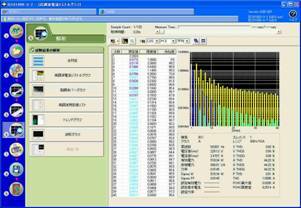 In the EN61000-3-2:2006 Am2: 2009 (IEC61000-3-2 Ed 3.0 Am2 or EN61000-3-2:2014) , requirements for measuring devices are set forth by IEC61000-4-7 Ed 2.0 Am1. 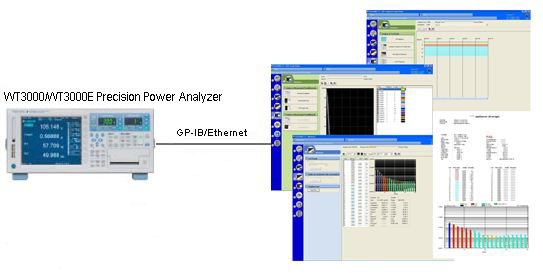 The table below shows the items the WT3000/WT3000E digital power analyzer complies with among the EN61000-3-2: 2006 Am2: 2009 (IEC61000-3-2 Ed 3.0 Am2 or EN61000-3-2:2014) related items in IEC61000-4-7 Ed 2.0 Am1. range (for crest factor 6) Complies within ranges on left. specifications items. Complies for general specifications. Firmware version 4.01 or later with the following functions. 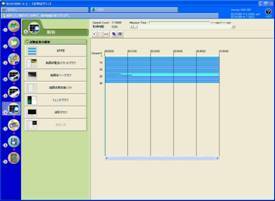 Data conversion Harmonic and waveform data can be converted to CSV format.